The complete META wide-span rack package with a shelf load of 230 kg is particularly suitable for bulky goods and containers in line with European standard dimensions. 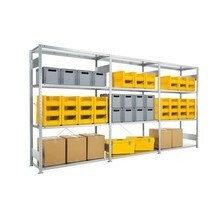 It is a general-purpose rack unit with high stability for large storage volume. This complete package provides you with a META wide-span rack with chipboard shelves that will enhance the efficiency and performance of your storage system. 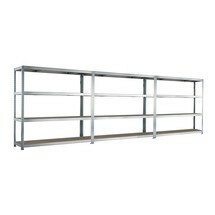 The surface is galvanised and therefore corrosion-resistant.